Do you have questions about the new Real ID requirements? Have questions about getting a Real ID, Driver’s Authorization Card or name change? 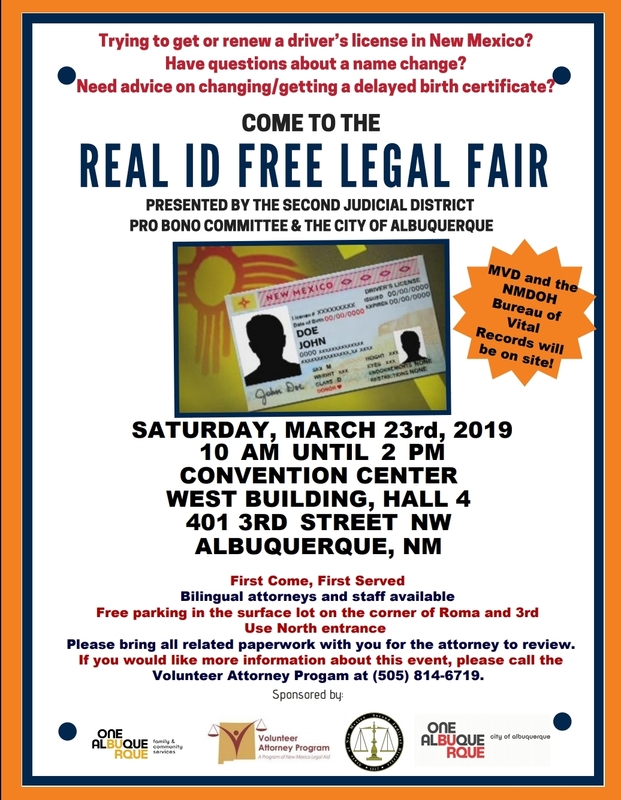 Come to the Real ID Free Legal Fair on Saturday, March 23, 2019 from 10 AM until 2 PM at the Albuquerque Convention Center West Building, Hall 4 (401 3rd St. NW Albuquerque, NM 87102). We will have attorneys on-site to answer your questions and the Motor Vehicle Department as well as the Department of Health’s Bureau of Vital Statistics will be there too! This is a first come, first served event. Bilingual attorneys and staff will be available. Please bring all related paperwork with you for the attorney to review. If you would like more information about this event, please call the Volunteer Attorney Program at (505) 814-5033!